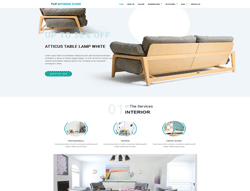 LT Interior Store is premium unique WordPress theme that targets for Architecture or Interior Store websites. This theme is exactly perfect to showcase and promote your interior store, besides, provide detailed information about the newest collections, its prices, materials or models. We also integrated payment methods that help customers easily buy your products for delivery through online ordering systems. LT Interior Store builds on strong framework with fully bootstrap under 100% responsive layout (fit well on all mobile devices), supports strong shortcode, drag-drop layout content, Bootstrap CSS & Hybrid framework. Besides, it comes with WooCommerce which is useful extension for shopping cart. In particular, LT Interior Store is highly customizable WordPress theme with unlimited color options and a color picker in the admin panel.